A mild mannered young man who believes he's a blood drinking vampire. A sadistic backwoods Satanist. A putrified, walking corpse. An FBI agent sworn to destroy a gang of toxic mutants. Veteran actor John Amplas has covered it all. 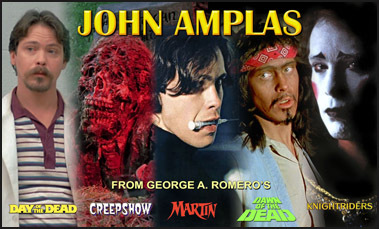 Genre fans will remember Amplas for his roles in George A. Romero's Martin (1977), Knightriders (1981), Creepshow (1982) and Day of the Dead (1985). 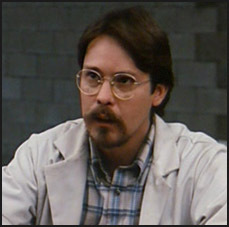 He also notched horror appearances in John Russo's Midnight (1982) and Charles McCrann's Bloodeaters aka Toxic Zombies (1980), and was casting director for the original Dawn of the Dead (1978). These days, Amplas divides his time between being a full time professor of acting at a local college and heading the Pittsburgh Playhouse Repertory Company as its Associate Artistic Director. Amplas will also feature as a special guest at the upcoming Fear Mongers: Fireside Chats about Horror Films show on March 31st at Dixon Place in New York City, co-sponsored by The Terror Trap. He was generous enough to sit down with us and discuss highlights from his film career. The Terror Trap: Hey John! TT: Tell us when you first knew you were interested in becoming an actor. JA: Fairly early on. When I was young, I would write plays and skits, and I directed them. You know, the “hey gang, let’s put on a play" thing. In grade school - I was about ten years old - my Uncle Jack was involved in local community theatre. And I did a lot of that throughout my high school years...directing and acting in the senior class play. 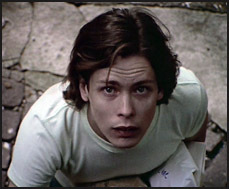 So anyway, I had an inkling I wanted to be an actor pretty early on. And of course there were the girls that offered the incentive. TT: Did you have any formal training? JA: Yes, I had formal acting training that began at The Playhouse School back in 1963. About a year and a half after high school, I spent three years in the Army...from early 1969 to late 1971. I served about a year in Vietnam during that time. When I got back, I attended fours as an acting major at Point Park University, and then college from 1972 through 1976. I studied voice and speech, movement, and all areas of production. Lots of crew work. I volunteered for anything and everything, just to be in the theatre and to be around actors and directors. If you really want to learn how to act, watch professional actors at work. Anyway, I graduated with a BFA when I was 27. Being a little older in college, I think it helped me to focus a bit more. Not that I ever walked away from a party. But the few extra years on my classmates helped me to be a little more disciplined, I think. So did the Army. My academics weren’t great but my performance classes were. 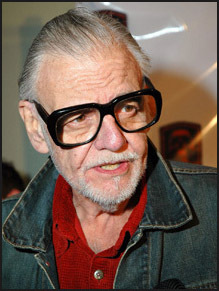 TT: How did you first meet George A. Romero? JA: I was cast in a musical in my senior year. I admit, musicals are not my thing. But apparently I moved well, so there I was. TT: What musical was it? JA: I remember the musical was called Philemon, written by Tom Jones and Harvey Schmidt. They were the same guys who wrote The Fantasticks, the longest running off Broadway play which ran close to forever. For whatever reason, George Romero came and saw the production. TT: Was there an audition process for Martin? JA: My work in that musical turned out to be my audition. The legend is that George originally wrote Martin as an older character. After seeing my performance, he went away, rewrote the script...and called me and offered me the role of Martin a few months later. Early that fall, I was in front of the camera. 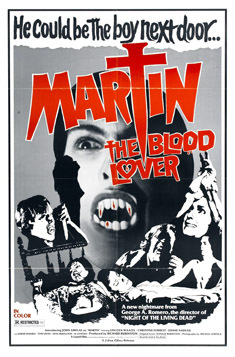 TT: At that point, had you been a fan of traditional vampire films? JA: Only in as much as I loved films, loved going to the movies. So I watched and enjoyed every genre, both good and bad. Of course, I liked all the early Hollywood stuff and Hammer films. I watched everything. TT: Any horror films you liked in particular? JA: Horror was not a specific leaning for me. I just loved movies in general. However, I was inspired by some of the usual suspects: actors like Lon Chaney Sr., Charles Laughton (both in their respective versions of The Hunchback of Notre Dame). Not exactly horror perhaps, but these were classic character studies about people who are different. Dealing with societal prejudice and superstition. Karloff’s Frankenstein monster fits that category for me. JA: Yes. All of them are blamed for something they didn’t do, or things about themselves that they can't help. Or they do something out of necessity, to live or protect themselves, not to arbitrarily kill or destroy others. TT: Any other horrors you've enjoyed? JA: Well, I also love a good shock movie like The Exorcist, which made me jump out of my chair. Not so much because of Linda Blair - she was primarily a prop - but because of Jason Miller’s suffering priest and William Friedkin’s direction. How did you approach such a tricky role as Martin, from the standpoint of acting and preparation? JA: An actor approaches the characterization of a role first through what’s on the page. And George wrote a brilliant script that made Martin’s dramatic action clear and well defined. For me anyway, what do I next is immediately try to understand the character. In other words, empathize with who he is. TT: What were your thoughts about the character when you read the script? I was struck by Martin’s isolation. His obvious sense of being different. Of not being able to fit in. Of having an obsession, an addiction that he himself did not fully understand the source of. Without going into my own life experiences, let’s just say I readily related to these characteristics. Remember, too, I had both the screenwriter and the director to guide me. Once you start shooting, it’s all about playing each moment as clearly and effectively as you can within the given circumstance. I hope that answer suffices, because I feel I'm starting to get into a lot of “Actor Speak”! TT: It's a great answer. Now, there isn’t a lot of dialogue for Martin. Particularly during the first half of the final released version. Is it true you had recorded a lot of narration that was subsequently cut out? JA: I'm sure it's true that there are lost scenes and narration missing from what became the recognized ninety minute version of Martin. That was to satisfy distribution needs to make it attractive to the movie going public at that time. However, some of that narration may be found in several of the trailers released...with me speaking directly to the camera. TT: Tell us about the longer three hour cut of Martin that has disappeared somewhere along the way. What was in it that differed from the final cut? JA: The three hour version apparently no longer exists. Unfortunately, it was lost somewhere along the way these past thirty-five years. The specifics of what I can recall about the longer version and how it compares to the final theatrical cut are a bit murky. TT: But do you think it works as is? JA: I think ultimately the film has stood the test of time, just as it exists today. Although I would agree: it would be very interesting to see that long lost three hour cut! TT: The many flashbacks in Martin are left up to the viewer’s interpretation. Did you personally interpret him as a true eighty-four year old vampire? Or just an imbalanced loner who has taken to fantasizing about being one? JA: In keeping with the ambiguity, the question of whether Martin is or isn’t a vampire is really left up to the viewer, isn't it? I will say, Martin certainly believed he was. TT: Martin’s attacks on his unsuspecting victims are messy affairs, lending a realistic approach to the story. Were those scenes difficult to shoot? JA: Well, if you were to count the seconds of blood on the screen, there's only about ninety seconds in total. But were they messy in terms of being effective? Yes, I’d say very. The physical staging of the attacks were fun to shoot, and I loved doing them. But I was twenty-seven years old. Still, I think even now - close to 62 - they might still be fun to shoot. TT: What was Romero like as a director so early on in his career? JA: My guess is that he’s pretty much the same today as he was back then. That is to say, a director with great skill in the craft of filmmaking. George’s best work is when he writes and directs his own stuff. When the film is entirely his own vision. He's also a really accomplished film editor as well. He loves the actors and crew alike. And he creates this family atmosphere on set that is comfortable and easy for all to work in. He did that on the set of Martin, for example, and with every set I’ve worked on with him. But I think most importantly, George has this genuine sense of humor that's always apparent in his films and with the people he works with. TT: What do you recall about working with Lincoln Maazel (who played Cuda) in Martin? JA: Oh, Lincoln was terrific. A gentleman of great wit and intelligence. He performed in vaudeville early in his career, and did a lot of stage work around the country and at my artistic home, the Pittsburgh Playhouse, in the 1950s. We enjoyed our time together on the set of Martin, in conversation about theatre and life. He really taught me a lot. Lincoln lived to be 104 years old and lived out his days on his son’s farm in Virginia. His son is Lorin Maazel, a world renowned symphony conductor. Lincoln passed away about a year and a half ago, still vital and with such a zest for life. TT: Romero’s future wife Christine Forrest is charming as Christina. What was she like on the set? Was the chemistry between the two readily apparent? JA: Yes, it was. Christine and I got along famously. TT: How would you describe your personal relationship with Romero? JA: My relationship with George is terrific. We currently travel together doing conventions and I have had the opportunity to present him with achievement awards given to him by fans. I consider myself lucky to have worked on six films with him and to call him a friend. A really good friend. TT: You clearly have a nice rapport with Romero, as well as Tom Savini...which is evident on the commentary you recorded for the Martin DVD. Do you keep in touch with Savini? JA: Yes, we do keep in touch. Savini and I live in the same city and we have worked together on several theatre projects. We also see each other at conventions. 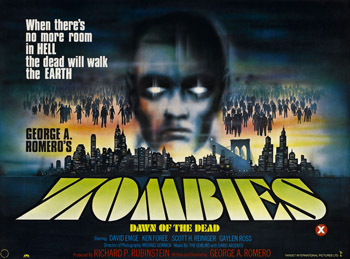 TT: You were casting director for Romero’s zombie masterpiece Dawn of the Dead. What was that experience like? JA: Long hours is the first thing that comes to mind. Of course, all filmmaking requires long hours. 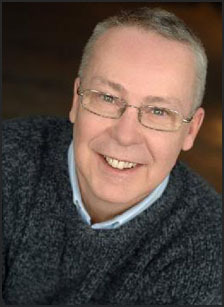 I was able to assist in the casting of David Emge (Flyboy). We were mutual friends from our Playhouse days. Also Randy Kovitz, who later worked on Knightriders. 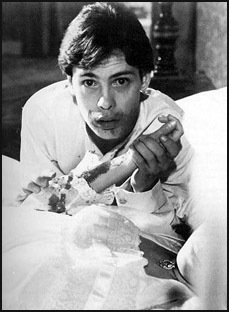 And Joe Pilato, who would go on to be in Day of the Dead. 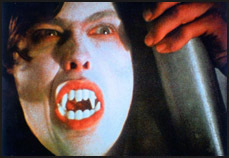 I was instrumental in casting a lot of the more recognizable living dead for Dawn. Such as Clayton McKinnon and Sharon Hill, and some others. They all have a cult following on the convention trail to this day. TT: What were you looking for when it came to casting the zombies versus the healthy, normal people? JA: People who were willing to withstand and endure long hours in grey, ashen makeup! Honestly, it wasn't hard to attract people. 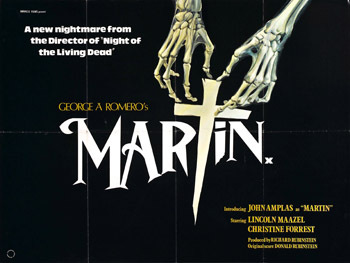 We had a lot of willing friends - and fans of George’s - who wanted to be a part of a George Romero film. TT: What did you get out of that experience? JA: Hmmm...Dawn really gave me a greater appreciation for the technical side of filmmaking. JA: Yes. 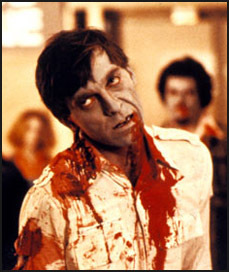 Acting in Dawn of the Dead was the icing on the cake for me. I always love to have a chance to sneak in unbeknownst to a viewer and still work in front of the camera. So my twenty seconds of screen time as the outlaw Martinez on the roof, where Scott Reiniger shoots me in the back and I fall off, was nothing but absolute fun. When I go to conventions, fans are always surprised to see my banner with a picture of Martinez from Dawn. They wonder, "Was that you?" TT: Let's try a "first impressions" game. Tell us the first thought that springs to mind when you think of your roles in the following films. Here we go: Bloodeaters (1980). JA: Knightriders was just a true pleasure. An opportunity to work with a young Ed Harris making his film debut. I was fortunate to hang out on the set outside in the sunshine (and rain) in a summer camp environment for ten weeks and get paid for it. Come to think of it, I made more money on that film than any other. 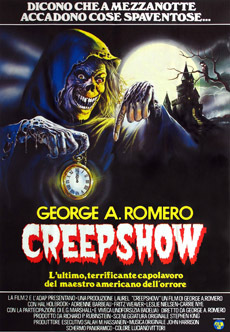 JA: Creepshow! Loved it. Just loved working on that. Savini called me to play the dead Nathan Gratham that comes from the grave to get his birthday cake. He needed a physically slight actor who would fit under the makeup of a corpse. I weighed in at about 125 pounds in those days. But it was great. I got to meet Stephen King. And work with the late great Viveca Lindfors. And also Carrie Nye. As well as a very much still alive Ed Harris (again). JA: Well, Midnight gave me the chance to work with John Russo (co-writer of Night of The Living Dead) and a long time friend of George's. 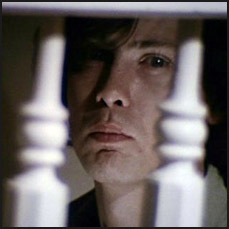 I was introduced to Russo through Raymond Laine, a friend of mine from the Playhouse...who worked with George in the early days and who played the lead in There’s Always Vanilla (1971). I haven't revisited Midnight since it was first shot, but fans tell me they like it. TT: Day of the Dead (1985). JA: Day of The Dead...the wonderful and talented Lori Cardille, Richard Liberty, Jarlath Conroy, Terry Alexander, Gary Klar. And the greatest screen performance by a living dead character since Boris Karloff, namely Howard Sherman in the role of Bub. Nowadays, you teach acting at Point Park University in Pittsburgh. What do you hope your students take away from your course? JA: At Point Park, we prepare our students with a technique - a sort of "how to" approach - to use their talent to enter and work in the professional world of acting. TT: Which do you enjoy most: acting, directing or teaching? JA: As a teacher and actor, I most love directing. TT: Do you enjoy appearing at horror conventions? JA: I absolutely love attending them. The fans of horror are the most appreciative and supporting fans of any genre. Conventions are love fests of mutual admiration. The fans know more about my work in the movies I’ve made than I do! TT: Any thoughts about your upcoming appearance at Fear Mongers: Fireside Chats about Horror Films in New York City on March 31st? JA: I am so looking forward to appearing at Fear Mongers, I can hardly contain myself. If I could...I would be there now as we speak, waiting for the program to begin. TT: Thanks very much for your time, John. It's been a real pleasure.